Ceramic engineering is the science and technology of creating objects from inorganic, non-metallic materials. The best known and most commonly manufactured examples of ceramics are clay, bricks, tiles, glass and cement. However, the industry is vast and also includes pottery and dishes - what many of us may think of first when someone mentions ceramics. When formed, ceramic products are also used to make diverse objects for a whole range of other industries. Some of which include products such as dental crowns which are used in dentistry and orthodontics, artificial joints within healthcare and even space shuttle tiles for spacecrafts. The possibilities are endless, which highlights how valuable the ceramics industry is. As with many large manufacturing industries, the production of ceramics also poses certain problems with regards to particulate buildup, pollution and employee welfare directly related to working environment. There are considerable occupational health concerns within the ceramics industry, with additional hygiene measures having been put into place within ceramics manufacturing facilities to reduce lead exposure, ultimately leading to lead poisoning. However, we believe our acoustic cleaning solutions go the extra mile to not only alleviate, but prevent other problems we see within ceramics production. 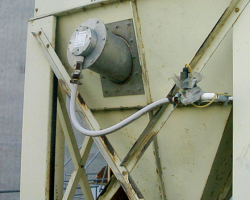 Primasonics Acoustic Cleaners have been solving material build up and flow problems in such key ceramic plant areas as weighers, blenders, pneumatic conveyors, fans and silos. Airborne dust concentration at various sections of the production process tends to be higher in the ceramics industry compared to other manufacturing industries. Case studies have found that the departments with highest dust concentrations tend to be grinding and glaze spray. Airborne dust particles that contain silica (the dioxide of silicon) cause very high exposure risks that can affect the respiratory system of workers in ceramic factories. Factory inspections suggest that approximately 80% of airborne dust particles within the industry are of respirable size - creating all kinds of health & safety and legality issues. The greatest occupational health hazard within ceramic production facilities is silicosis which can then lead to silico tuberculosis, to which both are correlated with the respirable dust and free silica content in the working environment. Workers who have been exposed for more than 20 years have shown lung disorders and damaged respiratory functioning due to dust not being cleared away properly. The two most important inputs within the ceramic industry are raw materials used and fuel. The key issue with raw materials used in ceramics is that the quality of the goods tend to be inferior, due to a high proportion of manufacturers being in the small scale sector and not having the money to invest. In addition to this, coal is one of the major sources of fuel for the ceramics industry. To economise on the purchase of coal, some manufacturers opt for coal that is more affordable and consequently poorer quality. When coal is of poor quality, it is needed in increased quantities in order to produce optimal levels of fuel. Several times, the coal supplied to the industry is of lower grade and is dusty and powdery creating particulate build-up in equipment and the air. When coal is of poor quality, it is needed in increased quantities in order to produce fuel. Increased use of coal causes an influx in dust particles and fumes, impacting on the already existing health concerns of workers furthermore and further heightening the environmental impact. Due to the nature of the industry, it comes as no surprise that the manufacture of ceramics creates pollution that contributes to environmental degradation - especially with the consumption of fuel. Air pollution is the most hazardous for the environment, with many ceramic manufacturing facilities being reported to have poor, unhygienic conditions both inside and outside the plants. Air pollution arising out of ceramic production is in the form of suspended dust particles, aerosol particles, smoke and unburnt particles of fossil fuels, paint and glaze spray particles and hot air. In many units, dusty working environment have been found and also unbearable thermal conditions in the kiln department. In colour, dyes and paint sections within ceramics plants, it has been found that hazardous chemical spray particles in the air affect the ceramics workers health. Plant designs including sanitary facilities and exhaust systems must be improved for increased production, employee safety and environmental welfare which is where Primasonics Solutions can help. Ceramics plants are also hit by emergency closures every once in a while to either tackle smog, or for necessary deep cleaning of the facilities to tackle material build-up. In such periods, plants require shutdown maintenance work which puts the facility out of business for a little while - resulting in loss of revenue and potentially costing companies thousands. 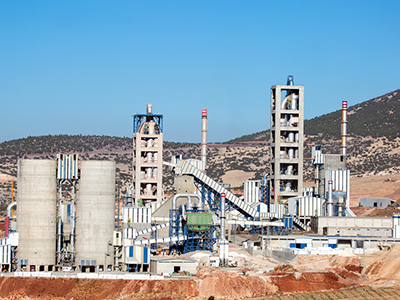 To prevent unexpected plant shutdown, regular cleaning of the ceramics plant must take place. By doing so, it prevents material build-up (especially dust exposure) to not only make the working environment safer for staff and the environment, but to boost productivity of the production facility. Primasonics Acousing Cleaning Solutions were designed especially for industries such as the ceramics industry. 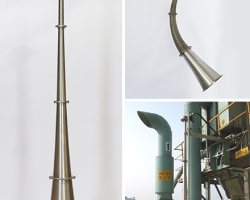 The innovative technology of our acoustic horns and sonic soot blowers is ideal to tackle and prevent particulate build-up, especially dusty by-product that can cause boiler fouling and slagging problems. The creation of rapid pressure fluctuations are transmitted into the particulate matter or "bonded" dry material causing the solid particles to resonate and dislodge from the surface they are deposited on. Once dislodged, the materials fall, either due to gravity or are carried away by the gas or air stream within the process. Material buildup restricts the storage capacity of dry bulk loading equipment and in severe cases, causes what is referred to as “funnel flow”. Not only does this mean machinery operates at a reduced rate, but dormant buildup is effectively wasted material and therefore wasted money - our cleaning solutions will help combat this. The installation of appropriate cleaning solutions will most importantly help to tackle the dust exposure experienced by plant employees. Not only will this improve health and safety standards, but should also enhance staff morale and in turn, boost the efficiency of employees resulting in maximum efficiency. Non Invasive - Acoustic Cleaners do not produce high-impact blasts, but are instead designed to reflect sound from solid surfaces. Acoustic Cleaning technology therefore prevents structural damage caused by intense machinery cleaning methods. Reducing downtime and extending the life of assets - By regularly dislodging all compacted materials, Acoustic Cleaners can successfully prevent surface buildup and subsequently reduce the effects it can have upon production rates. Increased Efficiency - By eliminating all forms of surface buildup, Acoustic Cleaners will maintain the mass flow of materials and therefore maximise the working efficiency of your equipment. Primasonics Acoustic Cleaning solutions meet standards set by industrial safety, security, health, hygiene and environment regulation acts. Our customers save time and money due to our cutting-edge industrial cleaning solutions which have extended the life of their assets, reduced downtime and ensured safety comes first. Contact us today to discuss how Primasonics industrial Acoustic Cleaning Solutions can benefit your ceramics plant.